Reluctant reader is a nice term for people who don’t like to read. But according to our teacher Mr. Darling, a reluctant reader is just a reader who hasn’t found the right book yet. Reluctant readers might be hesitant to read for many reasons, perhaps they are a slow reader, perhaps they’d just prefer to be outside or perhaps they just haven’t developed the habit. Whatever the reason, we do know that those who read tend to have stronger vocabularies, do better in school, and more importantly have access to a whole new world found in a book. One of the goals of education is to develop life-long readers. If you have a reluctant reader at home, here are a few suggestions to help turn them on to books. Visit your local book store or library and talk to the staff. The West Vancouver Memorial Library and their librarians are experts and really great at suggesting books for kids of all ages. Don’t be afraid to ask questions and keep asking. Local bookstores, like Kidsbooks, also offer a wealth of knowledge and there is something special about buying a new book that just might tilt the scales in favour of reading. Find a series. For a while my son flited from book to book and never really dug into any of them. Then he found Lemony Snickett’s Series of Unfortunate Events and he was hooked. The beauty of a series is that children get to know the characters, the vocabulary, and the pattern of the writing. This helps them to more easily delve into the book. Additionally, kids want to find out what happens next and enjoy collecting all the books in a series. Listen to good book. For many students, reading is a challenge. Whether or not this is the case, listening to a book being read has untold benefits and is a great way into reading. There are many great ways to listen to stories, the best probably being sitting side by side a loving parent. However there are many other ways to listen to a story. I really like Play Aways, they are the size of an iPod and have one book preloaded on them. They are available at most public libraries. For younger children, picture books on CD’s are a wonderful option. My daughter has a small CD player in her room and spends lots of time tucked away on her bed listening to stories. Forget about the books. Many children are intimidated by thick novels and all that text. Try something different, magazines, fact books, catalogues. Chickadee, Owl, Kids Discover, Sports Illustrated Kids, National Geographic Kids are just a few examples. They make a great gift for birthdays and holidays. And, who doesn’t love getting a treat in the mail once a month? Other less traditional options are the Kids Guiness Book of World Records or, for the sports enthusiast, check out sports trivia books or statistics books. Keep the car full of books. In the back seat of both of our vehicles is a basket of books. From the time my children were able to hold a book that basket has been there. Whether the drive is short or long the basket is there and my children read them. I’m fortunate that my kids don’t get car sick reading, not so fortunate that they don’t argue over the books. Rather than reach for a device when in the car, they reach for a book and it has been a great habit that we have established. They are captive and stuck back there, so why not grab a book…they do! 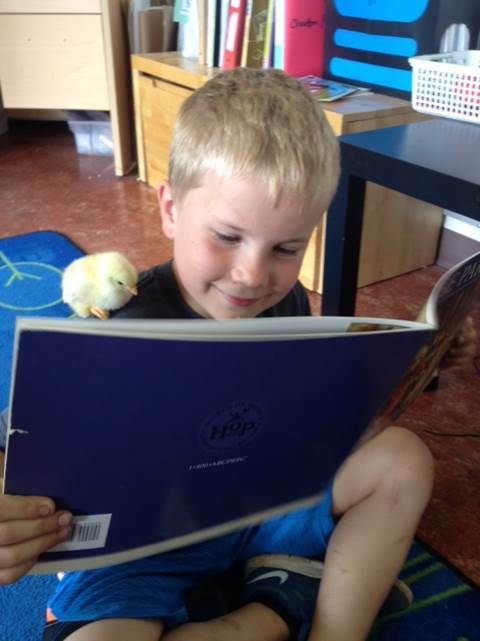 Be the reader you want your child to be. Model great reading habits for your children. Pick up a book in front of your kids and make time for reading. 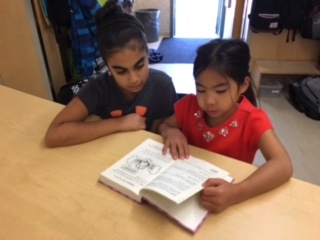 Parents’ reading habits play a large role in determining how often kids read: 57% of kids who are frequent readers have parents who read 5-7 days per week, compared to only 15% of kids who are infrequent readers, according to a recent Canadian survey. If you have a reluctant reader on your hands talk to your child’s teacher or our school librarian Mrs. Hunt. There are lots of strategies and tools available to help your child unlock the magic of a wonderful book and we are here to help.